When situations are a matter of life-or-death, there’s an expectation that reactions are similarly as extreme. 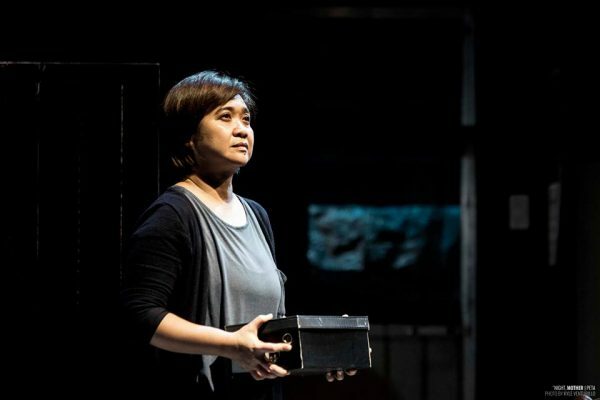 In Philippine Educational Theater Association (PETA)’s adaptation of Marsha Norman’s Pulitzer Prize-winning play, “Night, Mother”, the person whose life is on the line is decidedly impassive, leaving local audiences to question what they thought they knew about the suicidal state of mind. 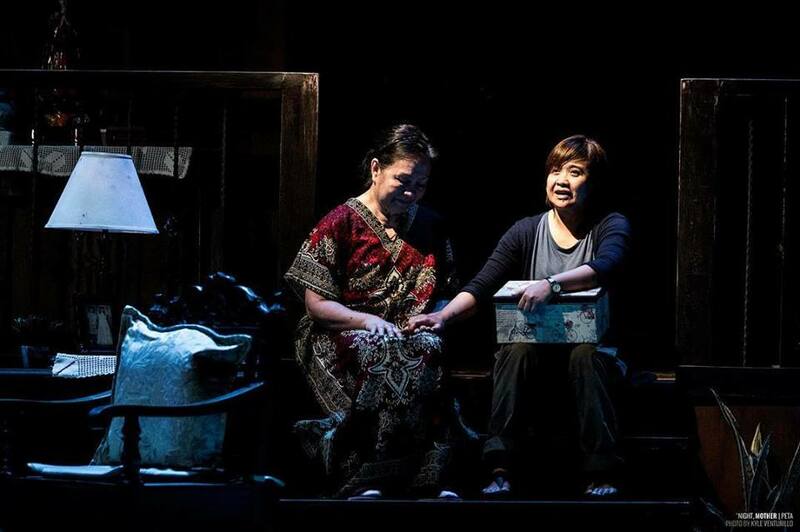 Jessie (Eugene Domingo), calm as anything, matter-of-factly tells her mother, Thelma (Sherry Lara), that she’s going to take her own life. She is rational and placid, while her mother–as she convinces her that life is still worth living–is all emotion. It’s an inversion of what tv and movies have told us about people at the end of their rope, or those dealing with depression and mental illness. Domingo portrays Jessie with abject resignation, which is not necessarily a bad thing. She presents a facet of depression that isn’t ordinarily shown. Jessie is in her 40s, epileptic, and living with her mother. Her husband has left her, and her son is going nowhere in life. It’s a lot, but she is not a woman without options or means. This is where the nuances of the illness she is battling comes in. She is not simply sad, or overwhelmed with problems looking for a way out, she is ill.
Lara, on the other hand, performs Thelma with sympathetic confusion and that familiar denial of someone who is a product of her generation where mental illness is taboo, or even unknown. She the emotion of the play, and any sympathy to be had is mostly for her. The play is not so much about saving Jessie as it is concern over what will happen to Thelma. What is about to happen, is happening to them both. The play is 90 minutes, without intermission, and happens in real time. Some parts of their conversation may be funny, but there’s no lightness to it. The tone of the entire performance appropriately conveys the gravity of the piece. The back-and-forth is more dramatic and emotional than tense. It was not made to be a thriller that keeps you at the edge of your seat, wondering if Jessie will go through with it. It’s a family drama that unpacks how she got to that point. Melvin Lee directs a highly-detailed and meticulous production. Staged on a hyper-realistic set of a typical Filipino middle-class household (production design by Ben Padero), and translated and recontextualized into the modern day (adaptation by Ian Lomongo), the audience becomes witness to a private and painful conversation that is so true and real, so quintessentially Filipino, it’s almost like eavesdropping into a neighbor’s living room. 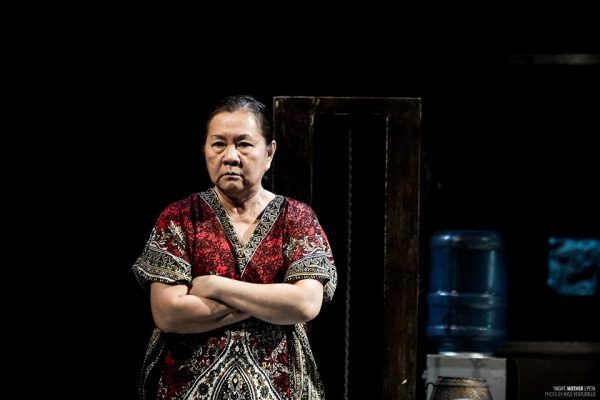 Perhaps Norman’s play–originally written in the 80s–continues to be relevant, but Lomongo’s adaptation contemporising it to present day Philippines is what makes the material truly resonant. The complexities of mental health hits a lot closer to home when we see it happen, well, at home. The hyper-realism of it all just helps the material succeed in what it sets out to do, and that is to somehow demystify mental illnesses and provoke conversation because depression, anxiety, suicidal tendencies, are not bourgeois diseases, or problems of the Western world. They happen, and are happening to everyday Filipinos, every day. The triumph of PETA’s “Night, Mother” is its realism. When we see the different and realistic manifestations of mental illness, we might be able to see it in real life, and it could save a life.